On July 20th, 1969, Neil Armstrong and Buzz Aldrin landed the lunar module Eagle on the moon, via the space flight Apollo 11. In epic fashion, they planted an American flag on the arid landscape and “claimed unchartered territory”. In a similar vein, IntraSee is proud to announce that as of February 2018, we are now able to fully automate the creation of a chatbot for the Enterprise. It will self-assemble and deploy without the need for manual creation, and without the need for large consultant and client resource staffing models. Practically, what this means is that we can deliver a “chatbot-in-a-box”, that with one push button will build and configure itself, and immediately be able to access your multiple on-premise and Cloud systems. Handling such things as self-service inquiries, transactional processes, workflow approvals, news and notifications, Enterprise search across multiple systems, interaction with content management systems, and Help Desk requests. This doesn’t just mean that your Enterprise systems will now be easy to use for your employees and managers (and students and faculty). It also means it will be easy for your IT organization to deploy and maintain. Which is the critical component of a chatbot implementation strategy. It has to be simple to maintain. Such that your IT organization is not, yet again, bogged down in “maintenance mode”, when they should be in (as Gartner advises) “innovation mode”. So, let us explain why this is such a breakthrough. Fast implementations using pre-built Q&A’s that provide some superficial benefits, but are, for the most part, just navigational paths to knowledge that the client has to identify as part of the implementation. The chatbot equivalent of “quick links”. 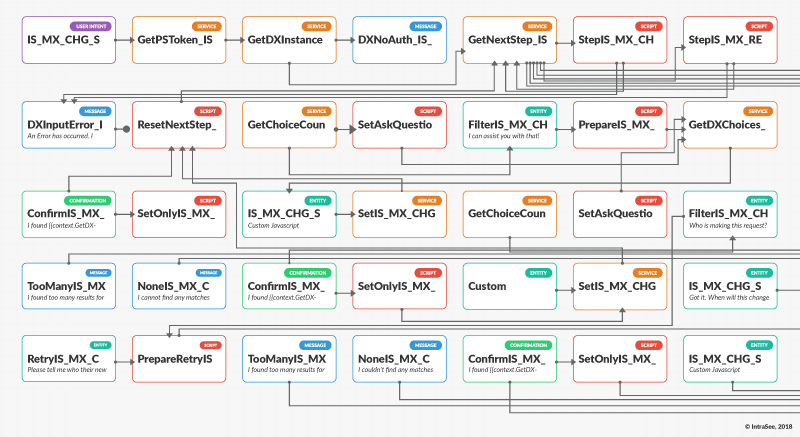 Massively long, expensive, and resource heavy implementations that require many months of analysis, and even more months creating spaghetti AI dialog flows that are pretty much unmaintainable. These implementations rarely work properly on day 1, and require that that client wait to see results while the chatbot learns. These kinds of projects are the favorites of large consulting companies, who see the advent of chatbots as a giant revenue stream, and a means to keeping their consultants off the bench. The best response any client should make when offered this kind of approach is, “no thanks”. Figure 1: Imagine having to create & maintain thousands of these? And this is just the front end. IntraSee has an alternate way, a better way. We provide a “Chatbot Lego kit” that plugs into your enterprise system (both Cloud, on-premise, and even your data warehouse) that is a definitional tool, complete with a pre-built suite of self-service functionality, plus adapters to all the major Cloud systems, and even on-premise systems (like PeopleSoft). Within four weeks it can be plugged into your Enterprise, configured to your additional requirements, and adapted to the systems you use internally and in the Cloud. Then you, literally, press the easy button, and the Chatbot creates itself. With one push button, the chatbot conversational UI is created and fully trained. Just like AlphaGo Zero – it does not need big data or a huge learning curve. You immediately have a chatbot solution for your Enterprise that is simple to implement, simple to maintain, but capable of performing even the most complex of tasks. You never need to manually create a chatbot dialog flow, intent definition, or entity definition. You never need to figure out how to integrate the dialog flows with your many Enterprise systems. You never need to figure out how your chatbot should behave when it encounters “errors” when chatting with someone in your organization. You never need to figure out how to escalate to a “real person” or create a service ticket. You never need to figure out how the chatbot can understand your unstructured content and digital assets. These “low level” functions are managed at a high level that goes way beyond traditional process management tools. So, what chatbot capability comes “out of the box”? The ability to get data securely (and only data that the human has access to) from all your Enterprise systems (including your data warehouse). The ability to perform complex self-service transactions. The ability to review/approve/deny workflow from your various Enterprise systems. The ability to find anything in your organization using a federated search capability. Plus recommend associated processes that match the search results. The ability to fetch personalized organizational news that is pertinent to the person asking for it. The ability to integrate with your current “Help Desk” solution (Cloud or on-premise). The ability to integrate with your current knowledge base. And the real beauty of all this, as the people in your organization will see, is that nobody needs to be trained. Nobody has to learn how to interact with this new solution. Nobody has to figure out where stuff is. Nobody has to deal with drop down menus and multiple clicks to perform the most simple tasks. The chatbot will learn how to interact with your organization using a UI method popular for thousands of years. Language. If this all sounds too good to be true, then we would advise that seeing is believing, and we would be happy to provide a demonstration. Please contact us to learn more or even see a live demo. Footnote: Chatbot technology is relatively new, but our efforts in building this are not. 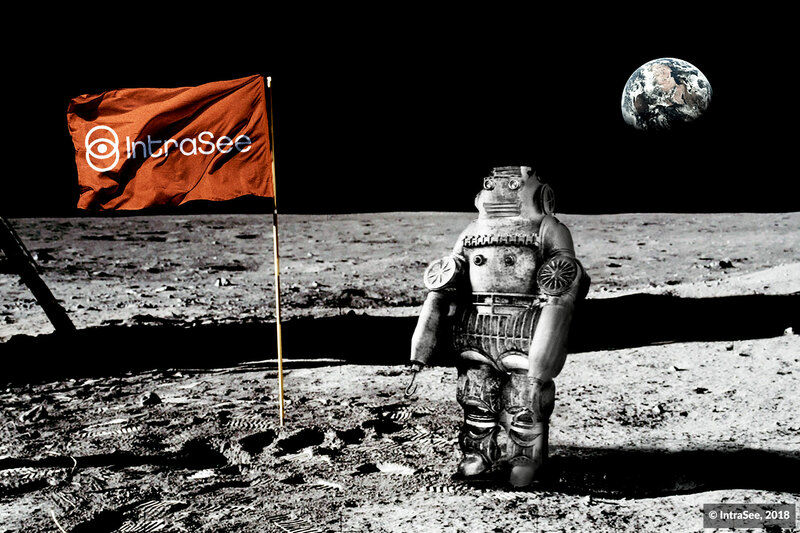 Like the lunar landing, we have spent over ten years building packaged solutions, tools and adapters, in order to get us to where we are today. The final piece of the puzzle was to build the actual integration and automation with chatbot.ai’s. And for that we had to wait until chatbot.ai technology was ready for use in the real world. Today it is, and it continues to get better and better. This is now a viable technology solution if implemented correctly. And that’s what we do.